The 2011 Dodge Durango adds a third row of seats for Chrysler's third attempt at making a competitive mid-size SUV not named Jeep. 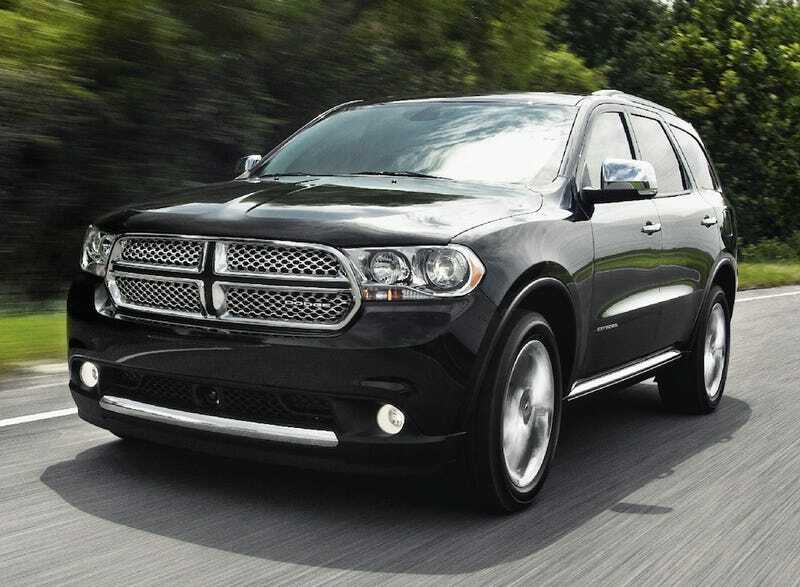 The new Dodge Durango shares the same Mercedes-Benz W164 platform used for the M-Class, GL-Class and just-revealed 2011 Jeep Grand Cherokee. The difference between the Grand Cherokee and the Durango is Dodge lengthened the wheelbase to add a third row of seating. Even though it's got three rows of seats, interior quality look to have received the same newly-found religious fervor Chrysler's displayed in the new Grand Cherokee. Also new to the interior is Dodge's new logo — the same logo you saw here first (and Allpar). Moving on to the exterior is where the similarities, positive in the interior, quickly turn negative. Although pleasantly contemporary, the exterior shares many design cues with the new Grand Cherokee — the curves, the front air dam, the stance — all of it screams Jeep. Strangely, what doesn't scream Jeep is the drivetrain. In the Jeep, it's called 4WD and in the Dodge, it's called AWD. We're putting a call into Chrysler to ask them for some specifics on the change in terminology. Also like the Grand Cherokee, the standard engine under the hood is the 3.6-liter Pentastar V6. But, unlike the Jeep Grand Cherokee it's not only got a Hemi, but Chrysler says it's got a Hemi. With a third row, a big Hemi-branded engine, and numerous references to towing things and making a vehicle for the "enthusiast" it's clear Dodge is hoping to embarrass the relatively meek Taurus-based 2011 Ford Explorer. Sure, it may have taken a little help from ze Germans to pose a credible threat to Ford, but isn't that what George Washington did?